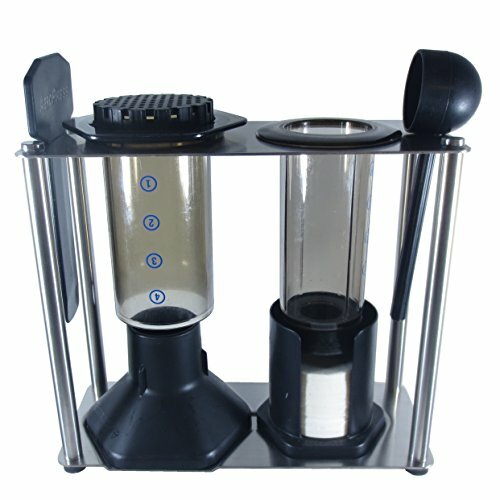 The Blue Horse AeroPress Caddy gives you a space to keep your AeroPress organized and clean as it dries between uses. It is made from solid, brushed stainless steel with non slip rubber feet to keep it in place and protect your counter top. Stop throwing the pieces in a drawer or laying them out on a towel to dry. Organize and free up your counter space with the Blue Horse AeroPress Caddy! The name AeroPress is trademarked and owned by Aerobie, Inc. AeroPress coffee maker not included. If you have any questions about this product by Blue Horse Products, contact us by completing and submitting the form below. If you are looking for a specif part number, please include it with your message.